Madrid, Nov 23 (IANS) Real Madrid Argentine coach Santiago Solari said on Friday that he was thrilled to take responsibility of the Los Blancos side in his first presser after being named permanent coach of the first team until 2021. Real Madrid leadership made Solari's appointment as coach of the La Liga side permanent on November 13, about two weeks after the October 29 firing of Julen Lopetegui, who was sacked following a run of bad results in La Liga play. 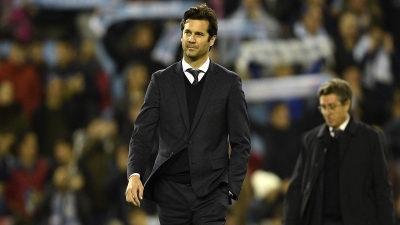 "I am very grateful and excited about this big and beautiful responsibility to be Real Madrid's coach," Solari said on the Los Blancos' official website, reports Efe news. The press conference came ahead of the Real Madrid's away La Liga clash against Eibar on Saturday at Ipurua Municipal Stadium in Eibar, Spain. "I expect an intense and feisty match, as they are a team that have a very clear concept of how they play. They are an aggressive team that press a lot. It will make for an entertaining game," the 42-year-old coach added.